Holding a single Dynamic Investment in a portfolio can be a profitable decision. But the NAOI knows that individuals are not comfortable allocating 100% of their money to the one ETF that a DI holds at any one time. Therefore, most DI users will use DIs as portfolio building blocks in traditional MPT-based asset-allocation portfolios. To explore this topic, let’s look at the “types” of DI building blocks that can be created. Market-Focused - DEP contains ETFs that track indexes for various markets such as Financials, Technology, Emerging Markets, etc. Dynamic building blocks enable a Dynamic Investment designer to select “groups” of equity purchase candidates for each DI and then let the “market” decide which to buy for the portfolio at the time of a Review. By doing so the designer’s task becomes exponentially simpler and portfolio performance skyrockets. A complete “Core and Explore” portfolio can be designed using only Dynamic Investments as illustrated in the diagram below. 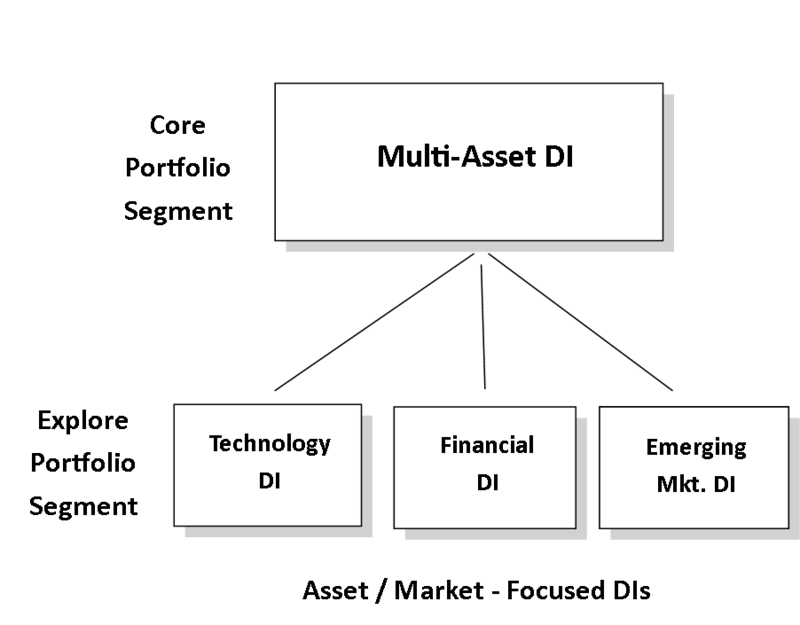 A Stock / Bond Multi-Asset DI can be used as the Core building block. Market-Focused DIs can be used in the Explore segment. The “explore” DIs shown above focus on specific market segments. Each has in their DEP an ETF that tracks the targeted Market Sector in addition to a Stock and Bond ETF. Thus the Sector ETF is only purchased and held for one Review period if/when it is trending up more strongly in price than either Stocks or Bonds. This strategy takes the risk out of Sector Investing! Allocations to each DI are at the designers discretion, however these are not the “life and death” decisions that they are in the MPT world where they are fixed for long time periods. Allocations in a Dynamic Portfolio are fluid and change with market trends - not based on subjective human judgments. Note also that all three of the Sector ETFs in this example can be placed in the DEP of one Dynamic Investment that would only buy the Sector that is trending up in price most strongly at a Review event. The configurations are infinite! With the innovative Dynamic Investment portfolio building blocks introduced on this slide the entire field of portfolio development changes virtually overnight, and for the better. This change continues on the next slide where MPT / DIT Hybrid Portfolios are discussed.